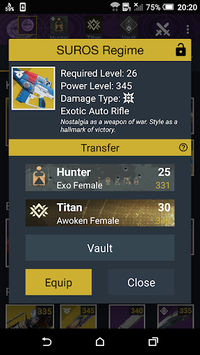 The Vault is a FREE item manager application for the massively popular shared-world shooter games; Destiny 2 and Destiny 1. Create weapon and armor sets for your characters, save them for later and equip them with one tap! Loadout Manager automatically finds your saved set items whether they are on another character or at your vault; transfers them and equips them to your Guardian. All with just one tap of a button! Automatically analyses, transfers & equips your highest light level items. You can now rate and review every weapon and armor. Found a new weapon or armor and want to know if it is good or bad? 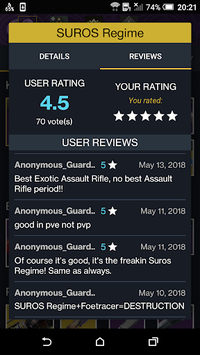 Just check its rating and reviews by other guardians and decide for yourself. The most frustrating thing when you are in a great fire team and completing consecutive strikes, raids, events is getting your inventory filled up with engrams/unnecessary items. The Vault has a "Grind Mode" feature that you can turn on with single tap. 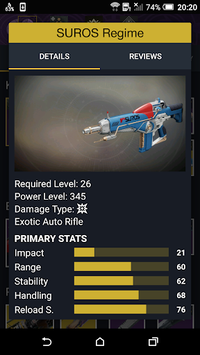 Grind Mode periodically checks your characters' inventories for engrams/unnecessary items and transfers them to your Vault; so that you always have space for new epic loot. - Item Search: Search for items by name, item type, damage type, item state (masterwork, locked) etc. Further refine your search with advanced sorting & filtering options. - Vendor Browsing: Check the items vendors have for sale, if you can afford them and what you need to accomplish to unlock them. Also see the community ratings and comments on weapons and armor sold by vendors to decide if they are worth your time. - Popular Items: Discover the best rated weapons and armor by the community in an easy to use fashion. Highlights the duplicate items in your vault. Get all stats and talent tree information of weapons and armor! After selecting a weapon or armor; tap on the item icon to see full details of it. - Item Sorting: Sort your weapons and armor by light level, rarity, name or type. - Damage Type of Weapons: Shows damage type of weapons on item icon. - Item Light Level: Shows light level of weapons and armor on item icon. Armor Quality Rating shows how good the stat rolls on your armor are by comparing them to the maximum possible rolls. The higher this rating is, the better. The Vault works only with current generation console (PS4 & Xbox One) Destiny 1 and 2 accounts. Legacy consoles (PS3 & Xbox 360) for Destiny 1 are not supported.